"Among them these writers encompass, if not a Baghdad entire, then at least a Baghdad of diverse experiences and perspectives, and absolutely a Baghdad focused on the Arabic world and not the Western." "Characters in this collection are frequently on the receiving end of unpleasant epiphanies. And as this engaging group of stories amply demonstrates, betrayal--whether by authorities, religious leaders, neighbors, colleagues, or liberators--is a subject that Iraqis know all too well." "This anthology's status as perhaps the first collection of Iraqi crime fiction ever published makes it a landmark." "The overall effect of this gathering of stories is kaleidoscopic: shifting fragments that, coming together in the collection, create a sense of Baghdad's uneasily beating heart...It is a superbly multidimensional, many-voiced, defiant collection." 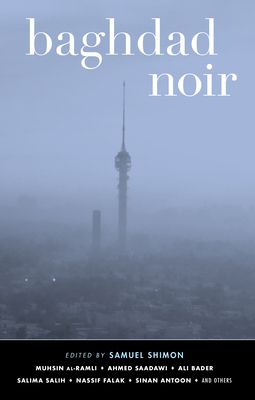 "Baghdad Noir is the latest addition to the simply outstanding 'Noir' anthology series from Akashic Books...A simply fascinating and at times compulsively driven read." "Baghdad Noir is a monumental achievement for Akashic's long-running Noir series. The collection goes so far beyond the Iraq most of us have been exposed to over the last twenty years and offers up a vision of this important world city in all its complexity and humanity...This is a vital book, in every sense of the word." " An] engrossing collection of crime stories all set in various districts of Baghdad...Presented with a detailed map of the ancient city to illustrate where all the stories are based, the plots are all well-executed and offer various takes on the trusted genre." Akashic Books continues its award-winning series of original noir anthologies, launched in 2004 with Brooklyn Noir. Each book comprises all new stories, each one set in a distinct neighborhood or location within the respective city. Now, one of the world's most war-torn cities is portrayed though a noir lens in this chilling story collection. Brand-new stories by: Sinan Antoon, Ali Bader, Mohammed Alwan Jabr, Nassif Falak, Dheya al-Khalidi, Hussain al-Mozany, Layla Qasrany, Hayet Raies, Muhsin al-Ramli, Ahmed Saadawi, Hadia Said, Salima Salih, Salar Abdoh, and Roy Scranton. While all Iraqis will readily agree that their life has always been noir, the majority of the stories in Baghdad Noir are set in the years following the American invasion of 2003, though one story is set in 1950 and three are set in the 1970s and 1980s. Yet it is this recent history of Iraq--over the last few decades--that serves to inform its present...Cementing the destruction of Iraqi life was Saddam Hussein's invasion of Kuwait in 1990. But that was hardly the end of Iraq's noir story. In April 2003, the US invasion, though it precipitated the end of Saddam's dictatorial rule, killed off any possibility of a secular, modern Iraq once and for all. Baghdad Noir testify to the enduring resilience of the Iraqi spirit amid an ongoing, real-life milieu of despair that the literary form of noir can at best only approximate. Yet the contributions here manage to hold their own as individual stories, where the rich traditions of intersecting cultures transcend the immediate political reality--even while being simultaneously informed by it. Much like the diverse tapestry of cultures that join together on the banks of the Tigris to form the City of Peace, Baghdad Noir reveals that there's nothing monolithic or ordinary about the voices of its writers. Samuel Shimon was born into an Assyrian family in Iraq in 1956. He is the cofounder of Banipal, the renowned international magazine of contemporary Arab literature in English translation, and the founder and editor of the popular Arabic literary website Kikah. His autobiographical novel An Iraqi in Paris was published in five languages, and he edited Beirut39, an anthology of new Arabic writing.